Our North Carolina car accident lawyers have just read the data released by the National Highway Traffic Safety Administration (NHTSA) revealing just how well safety restraints in all types of vehicles work to help save lives. According to the National Occupant Protection Use Survey (NOPUS), there is an obvious trend toward more and more people opting to use seat belts (85%), up from 84% in 2009. The data just released in May 2012 indicated that there were 22,187 people killed in motor vehicle accidents in 2010. Only 9,934 (44%) of those who died were wearing seat belts. The largest number of fatalities by age group was the 25 to 34 year old group, where 2,209 (63%) of the 3,489 fatalities were not wearing seat belts. Another interesting statistic in the report was the difference in seat belt use depending on the vehicles being operated. For example, 64% of the people killed while driving a pickup truck were not wearing seat belts; 57% of the drivers of SUVs killed were unrestrained; 47% of van drivers killed were not wearing seat belts and 44% of the passenger car driver deaths were unrestrained. The use of a combination lap and shoulder seat belt is shown to reduce the risk of a fatality for those riding in the front seat of a passenger car by 45%, in addition to reducing the risk of a moderate/critical injury by 50%. The numbers go up even higher for pickup trucks, where the use of a lap and shoulder combination can reduce risks of a fatality by 60% and a moderate/critical injury by 65%. As our Charlotte car accident attorneys have known for years, the chances of survival after being ejected from a vehicle of any type are slim. The data revealed that 78% of all the people ejected were killed and a mere 1% of the people wearing restraints were ejected. According the NHTSA report, North Carolina drivers were diligent in their usage of seat belts or restraint devices, with 89% of all drivers using some sort of device. 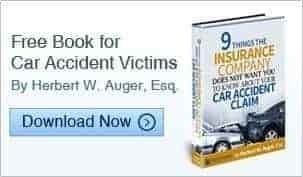 Accidents involving passenger cars, pickup trucks, SUVs, vans result in the loss of loved ones or cause horrific, disfiguring and maiming injuries that haunt families. You wonder why it had to happen and can’t digest all of the arrangements that must be made or the things that face your friends or family members as they struggle for survival. It all seems overwhelming. At times like this, it is very important that you seek the advice of an experienced North Carolina car accident attorney. The attorneys at Auger & Auger have nearly 40 years of experience representing clients in Charlotte and throughout North Carolina in serious car accidents. We know what you are going through and we have the experience and compassion to guide you through this difficult time. Contact us now so we can set up an appointment to sit down with you in a confidential consultation to discuss your situation and the options available. Our attorneys and experienced staff will be with you every step of the way during this difficult time. We handle cases on a contingency basis, meaning you will never owe our firm a fee unless we make a monetary recovery for you. Our North Carolina dog bite attorneys know what horrific injuries can be inflicted on small children, or even adults, who have been attacked, bitten or maimed by an aggressive dog. Too often, these attacks result in disfiguring injuries requiring corrective cosmetic surgery, or sometimes even death. News Channel 36 just recently reported such an incident that occurred here in Charlotte, North Carolina, involving the attack of a seven year old child by a pit bull. Seven-year-old Malik Albright was reportedly attacked by the eighty pound American Bully Terrier, named “DK”, causing lacerations and deep facial and leg wounds. A child is no match for an aggressive dog. Malik and another seven-year-old Elijah Howzer, were playing when Elijah took him into his back yard and allegedly told the dog to attack Malik. The father, Ricardo Howzer, denied those allegations and said children were not allowed in the back yard even though none of the dogs had ever exhibited signs of aggression. The Mecklenburg County Animal Care and Control Center has taken the dog and Howzer is fighting to save its life. Statistics indicate that there were 31 fatal dog attacks in the U.S. in 2011, with pit bulls accounting for 71% (22) of them. Interestingly, 68% (15) of the 22 pit bull victims were adults between the ages of 32 and 76 and 32% (7) were 5 years old or younger. Pit bulls ranked as the most dangerous dog breed by number of fatalities, with Texas and California leading with 4 each and North Carolina , New Mexico, South Carolina and Virginia with 2 each. In North Carolina, the general rule is that the owner of a dog is not responsible to the other party for a bite if the dog has never exhibited any aggressive tendencies previously, commonly called the “first bite rule.” However, owners can be responsible if they knew or should have known of the dangerous propensities of a particular breed such as a pit bull. Otherwise, every municipality in North Carolina makes its own decision about leash laws and Part 2, Section 3, Chapter 71 of the Code of Ordinances is Charlotte’s leash law. However, under North Carolina General Statutes, Section 67-4.1, owners of dogs declared by a municipality to be a “dangerous dog” can be held strictly liable for injuries caused by an attack. Finally, as in all personal injury matters in North Carolina, the contributory negligence of the injured party or parties can serve to defeat any recovery. If you, a family member or a friend have suffered injuries from an attack by a pit bull or other aggressive breed, you need to seek the advice of an experienced North Carolina personal injury attorney. The attorneys at Auger & Auger have nearly 40 years of collective experience in representing clients throughout North Carolina in a wide array of personal injury matters. Contact us to schedule your own confidential, no obligation consultation to sit down and discuss the facts and circumstances of your particular case. We have five offices, three in Charlotte and one each in Raleigh and Greensboro. Cases are handled on a contingency basis so you will never owe us a fee unless we make a monetary recovery for you. Our experienced Charlotte truck accident lawyers know that big rig truckers work long hours to meet deadlines and many tragic accidents result from their not having had enough rest periods and sleep. When the stress and strain of their job is coupled with sleep apnea, it creates a lethal combination that can lead to catastrophic injuries and death to the driver and others. Because of this, the Federal Motor Carrier Safety Administration is recommending higher standards for evaluating sleep apnea among drivers. To accomplish this, the administration is going to work with medical professionals and industry groups representing labor and safety to evaluate how to better control the problem, where it exists. This is a proactive awareness program to screen drivers and offer them treatment. Sleep apnea is a medical disorder that causes an individual to have abnormal breathing or actually stop breathing during sleep. It is often accompanied by snoring and does result in fatigue and daytime sleepiness, to the extent that someone with the condition can fall asleep at their desk or while driving. Research has indicated that those with a BMI, a measurement of body fat based upon height and weight, of 35 or higher increases the likelihood of having sleep apnea. The most significant problems the condition presents for truckers is in their ability to perform, such as drowsiness, fatigue reduced reaction time, driver inattention and distraction, among other things. In fact, a trucker with sleep apnea is 242% more likely to have an accident, according to Harvard Medical School professor, Charles Czeisler. One firm, Schneider National, has instituted a program to detect drivers with sleep apnea and it reduced accidents by 30% and reduced the monetary costs of accidents by 48%, not to mention a dramatic savings of $539 in health care costs per driver per month. The experienced North Carolina truck accident attorneys at Auger & Auger have been representing clients in Charlotte and throughout North Carolina for nearly 40 years. We know the results are catastrophic when an 80,000-pound tractor trailer rig and an average 4,000-pound vehicle collide. Lives are lost, and devastating, maiming injuries are inflicted to those in a vehicle that is no match for a large truck traveling at highway speeds of 65 to 70 miles per hour. These collisions often occur at night with few witnesses, if any, and the determination of negligence and causation must often be established by experts and attorneys experienced in these massive accidents. The trucking company will have their team of investigators on the scene attempting to place the blame on someone other than their driver. Since North Carolina is only one of five states that still recognizes contributory negligence as an absolute bar to recovery, it is imperative that the injured party or parties are not even 1% at fault. Most other jurisdictions have some form of comparative fault. Contact us to schedule your confidential, no obligation consultation to discuss the particulars of your case. We have five conveniently located offices, three in Charlotte and one each in Raleigh and Greensboro. We handle cases on a contingency basis, which means that you owe our firm no attorney fee unless we make a monetary recovery for you. Our Charlotte North Carolina car accident attorneys have confirmed what we had already suspected for years. According to a recent report by the Governor’s Highway Safety Association, the state of North Carolina ranks second in the entire United States for the number of deaths of 16 and 17 year olds as a result of car accidents. As a result of these frightening statistics, there are various programs developing across the country to try and help reduce the number of teenage fatalities through education and awareness. One of these is a local non-profit program called StreetSafe, which was started by a retired police officer to make the learning experience as much fun as possible in hands-on situations with certified law enforcement and fire department personnel. In a recent SafeStreet program, some 130 teenagers participated along with their parents on a Saturday at Apex High School in Apex, Wake County, North Carolina. For those interested, there will be programs in Johnston County and other schools in the near future. Some of the topics covered are safe driving practices and the non-use of cell phones, texting devices and GPS devices, which cause driver inattention, in addition to the dangers of attempting to operate a vehicle while being under the influence of drugs or alcohol. To emphasize the dangers of trying to operate a vehicle in an impaired state, students were asked to drive a golf cart while using goggles simulating intoxication. Quickly the teens realized how difficult it was to operate the golf cart and how easy it would be to turn it over or have an accident under those circumstances. The Governor’s Highway Safety Association findings confirm that teen auto accidents are one of the leading causes of teenage deaths in North Carolina and across the country. Inexperience coupled with various distractions that teenagers face such as talking to friends, texting, talking on their cell phones, following a GPS device offering directions or being under the influence of drugs or alcohol, all create the perfect storm for an accident involving horrific injuries and even death. Drivers who are drunk or on their cell phones quadruple their likelihood of their having an accident and those who text while driving are eight more times likely to be involved in a collision. The experienced North Carolina car accident attorneys at Auger & Auger know the fear that every parent has when their teenagers begin to drive and when they pile into a car being operated by another teen. Unfortunately, some of these situations end up with you receiving a late night call saying that your child has been involved in a bad North Carolina auto accident. If you, your family or friends have had to endure the pain and grief of losing a teenager in a car accident or had to see them with devastating injuries, contact us to schedule your own confidential, no obligation consultation so that we can sit down, discuss your situation and advise you of the possible claims or causes of action that may be available to you. We handle all cases on a contingency basis, which means you will never owe us any attorney fee unless we make a monetary recovery for you.